This list is arranged by theme to make it easy to incorporate them into your storytimes. Many could fit more than one theme, so hopefully will be adapted into whatever storytime you choose. It would be great to include books that encourage global awareness in every storytime, not just a special "International" one, or during holiday celebration-- but more as an everyday occurrence. I've chosen books published in the last six years (from 2006-12) which are still in print as of February 2012 so that these are books you can find and use! Charming, sweet and laugh out loud funny -- this is the story of what happens when the baby wombat meets the newcomer to the human household . . . another baby. Text and illustrations perfectly complement each other. Also enjoy its predecessor, Diary of a Wombat (2003). Noot is from a village in Thailand where umbrellas are made. She has watched her father make the bamboo frames, helped her grandmother make the paper to cover them, and now is given a chance to paint the umbrellas like her mother. The traditional decorations are flowers and butterflies . . . but Noot wants to paint elephants. 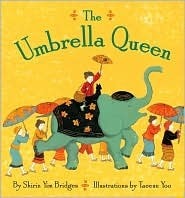 What will the king think when he sees her unusual umbrellas? Lots of cultural elements plus a sweet story about imagination and artistic freedom. Illustrations are linoleum print with pencil; muted colors on yellow paper. Beautifully designed. The author has lived in many countries and currently lives in California. The illustrator was born and raised in South Korea and lives in New York. Norris the bear is patiently waiting beneath the tree for the plorringe to ripen and fall. But two other creatures, a raccoon and a mouse are also waiting nearby. What will happen? The cats want to see the world, but they can't seem to push themselves out of the book, or leap out of it, so they enlist the help of the reader in wishing themselves out. It works! They send a postcard, then return with even more cats, who want to see the reader. Also enjoy its predecessor, There Are Cats in this Book (Candlewick, 2008). A child plays with his/her mother's sari (varies depending on the page) -- pretending it is a train, a river, a rope, in this delightful book. The text is short enough for even a toddler storytime and the illustrations are bright and appealing. The endpages show how to wrap a sari into clothing. A great accompaniment to storytimes featuring clothes, like What Will You Wear Today, Jesse Bear?, The Jacket I Wear in the Snow, and Ella Sarah Gets Dressed. Though this one seems perfect for an individual child, it also makes for a fun, interactive storytime. You can ask children to predict what might happen as you follow the instructions on each page. They're sure to encourage you to shake the book a bit harder and be delighted by the results. A mother makes a call to order a cake, and a whole fleet of little people get to work, using construction machines to make a cake: a crane lifts the eggs, a bulldozer moves a pile of sugar. A visual delight. The text gives straightforward directions on how to bake a cake, while the illustrations display a wonderful imagination. If you haven't met Walker's adorable giraffe Ollie, you're in for a treat. The short rhyming text, appealingly simple style of illustration, and exuberant Ollie are perfect for toddler storytimes. You might also enjoy I Love to Sing and I Love Birthdays. After dog reads Puss in Boots he is convinced that he needs some fancy footwear himself. But though whatever he tries seems perfect at first, it ends up not being so good for digging, or for scratching, or for running -- all those things dogs love to do. Will he be able to find the appropriate footwear? Pair with Pete the Cat and sing Laurie Berkner's "Boots" for a fabulous foot-stomping storytime on footwear! Vinson (Ming Da)'s grandfather comes to visit from China and begins teaching him Tai Chi. But Vinson is impatient and doesn't appreciate the strength that comes from stillness, until he gets to know his grandfather a little better. He practices and learns more about his cultural heritage, learning to take pride in his heritage and to appreciate his grandfather. Tai chi poses are included in illustrations below the text in addition to the striking illustrations throughout. Though it ends with Chinese New Year, this book would make a great read aloud for early elementary age children any time of the year. Silliness abounds as every day Millie the Cow lays in wait for the mail carrier -- to scare him! But things get too out of hand -- the farmer's packages arrive broken and the mail carrier has nightmares. Something must be done! Wonderfully expressive illustrations are incredibly appealing. There are wonderful sensory details in this poetic text: smells of cinnamon wafting through the house and images of rice falling like snow . . . there's a bit of magic in this kitchen. When the baby elephant is separated from the other elephants after a storm, he is chased by monkeys before becoming friends with the water buffaloes. This playful rhyming text is filled with animal sounds, both of which make it a great choice for reading aloud. A little boy makes shapes with dough as his mother makes chapatis. He forms a snake, mouse, and cat before making his chapatis. Instructions for making this Indian flat bread are in the back. The short text and simple style of the illustrations (uncluttered, strong black outlines) make this a good choice for storytime sharing. Anton has a magic hat. A real one. Watch as Anton practices and learns to do real magic . . . or does he? Limited color palette, charming illustrations, and a short text that is perfectly suited to reading aloud . . . this one is storytime magic! 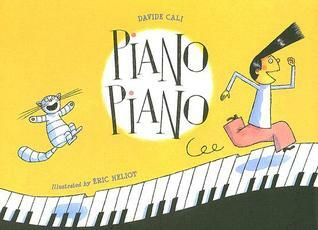 Marcolino hates every minute he has to spend practicing the piano each day. There are so many other things he'd rather be when he grows up. But he also wants to please his mother. Fortunately, his grandfather has some other ideas to help Marcolino find his own musical passion. Photographs illustrate the story of young Helen who needs new shoes to attend a wedding. But none seem quite right, so her mother takes her shopping to find the perfect pair. Everyday life in Africa is seldom depicted in picture books. These photos show home life as well as a bustling marketplace. Lucy gets a new red wagon, but doesn't want to use it for chores. When her mother sends her to the market, she and her friends invent all kinds of play on the way there. The wagon becomes a train, a boat for pirates, before Lucy arrives at the story for the shopping. Use in storytimes with books like John Burningham's The Shopping Basket. When a little black dog finds a bright red umbrella, he is blown away and has adventures around the world. Settings range from clouds, to the African savannah, to under the sea. At the end, he ends up safe at home again. Beautiful paintings illustrate this wordless story. If you've never tried a wordless book in a storytime, this might be the book to start with -- the illustrations are just so compelling. At first Little Wolf wants the tender green leaf to eat, then in the summer he wants the shiny green leaf to use as a mirror, then in the fall he wants the soft brown leaf to rest his cheek against -- and each time the Big Wolf tells his to wait, that soon it will fall. When it doesn't, Big Wolf climbs the tree despite the snow of winter. It's so high that Little Wolf worries and decides it probably isn't worth the risk. When Big Wolf finally reaches it, the leaf crumbles. But rather than disaster, this is magic: the pieces look like "a rain of gentle stars" and Little Wolf tastes a tiny piece, sees how bright one is, and feels a gentle piece slide along his cheek. A perfectly lovely ending.